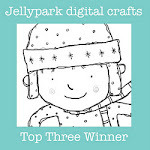 Patti is the very talented artist and owner of http://pholkartblessings.blogspot.co.uk/p/etsy.html and she is offering our randomly drawn winner 2 digi images from her delightful range....too good to miss out on! Don't forget that we need to see a topical scripture, or an uplifting message that goes with our theme. I do know that a member of our Design Team chose to make a card with Spring in mind, and another has made something for Autumn....you really do need to go take a peek at all the inspiration on the challenge blog......and of course, I chose Christmas.....yaaaaay! You know that I really do like to use traditional colours for my Christmas cards, but I thought that I'd ring the changes and go for this blue and brown combo....and I quite like how it turned out! Isn't this little fella just the job? I think he looks a little surprised to be left out in the snow....hahaaa! Did I ever mention that I have a humungous amount of buttons? Yep, so this was a good excuse to use this one......and I poured a little of that fine white glitter onto a dot of glue, inside the star shape. 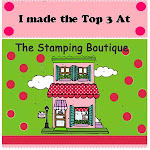 I love that brown hessian......trying to use it very carefully, because I have only a little of it......love it! It still amazes me that a scripture may be found for every occasion, every circumstance, every emotion.....and you just have to know that I would love this one! See?.....it's a commandment to have snow....hahaaaa! The final touch was to put this pearly snowflake button into the top corner....and that's another card to add to my growing stash! 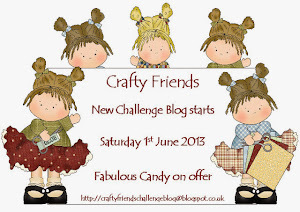 Please come over and join us in this fun challenge.....I'd love to see your creations! This is a totally adorable card, Anne-Marie. The elements and textures are so wonderfully fun. I'm not a big fan of winter and snow (as you probably already know), but I can definitely handle it in your format here (smile). The glitter is the perfect touch! Hi Anne-Marie, oh this one is just adorable! Love the snowman and your button is a perfect touch. Bit early for me to be making Christmas cards yet - I wait until 1st Dec!! This is so adorable, Anne-Marie! I love the papers and texture! This is gorgeous Anne-Marie. Such a fabby snowman. I love the papers with great textures and of course your special detailing. Fabulous card, sis! I love the hessian, the rounded corners, the stitching and the colors. Love that verse you came up with too. :) That's a good one. 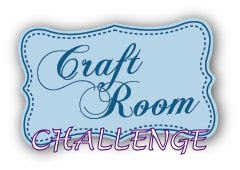 When I feel better and get back to crafting I plan to join in the Twist of Faith challenges. Blessings and hugs from across the pond!!! I love how you added a strip of burlap to your Christmas card and the colours you used. It's a beauty.. mate !!! The layers are fabulous and I love the hessian strip! Your sparkly snow really makes your card 'shine'! hee!hee! I love that you found a scripture about snow! !